The Use of a BMI Chart to Manage Obesity. The BMI (body mass index) is used to show the amount of body fat by using a formula which finds the relationship between your weight and height. Your BMI will reveal to you how suitable your weight is for your height. Weight alone does not show the level of body fat while the BMI does. Should your BMI (body mass index) indicates a level higher than normal, there is greater possibility of you getting type II diabetes. If you are a diabetic, weight loss and attempts to get your weight to the normal level do assist you in the management of your diabetes. In your attempts to lose weight, the BMI (body mass index) can help to indicate your progress. 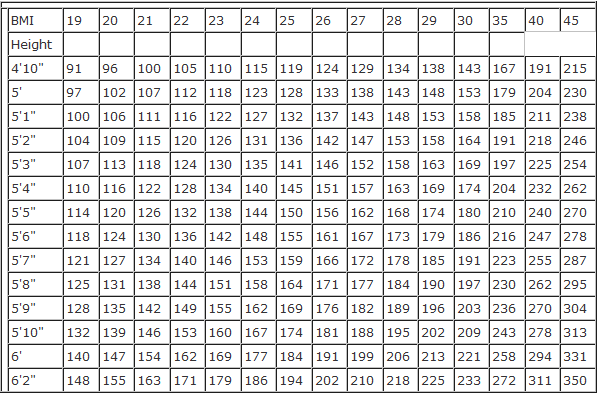 The chart below shows at which level or range your weight is, normal, overweight, or obese. After this, check the weights given for the normal weight range. This is the range to aim for. With loss of weight as well as exercise, medications for diabetes can sometimes be lessened, if not stopped completely, when the body develops reduced insulin resistance. Use the chart below to determine your BMI (body mass index). On the left side of the chart, search for your height. Then, move across to find your present weight. Look upwards to the top of the chart and you see a number which is your BMI. If your body mass index is higher than 40, you’re considered morbidly obese. If your body mass index is higher than 30, you’re regarded as obese. If your body mass index number is between 25 – 30, you’re considered overweight. You will find that there are numbers which have been rounded together as a result of insufficient space. In that case, use the number which is closest to the measurements of your weight and height.